Fuelling the writing | Damian Trasler's Secret Blog - Do Not Read! ← Writing collaboration – Is co-writing a contradiction? In his book “On Writing” Stephen King does an excellent job of dispelling the myth that great writers need something like whisky or drugs to function better. Hemingway didn’t drink because he was a great writer, he drank because he was a drunk and he happened to be a great writer too. So, drinking beer doesn’t help me get my writing done, and I would never claim taking any kind of narcotics helps you do anything except get poorer and die young. But coffee… Ah, coffee is a different thing altogether. In the UK, I drank a lot of coffee. Working from home in Bournemouth I worked in the breakfast room, just off the kitchen (Look, it was a weird house, ok? Breakfast room AND dining room…) mainly because it was warm in the winter (because the boiler was in there too) but also because that kept me close to the kettle. I would drink instant coffee in much the same way as other people chain smoke…as soon as the cup was empty, I would hop up to refil it. Once we arrived in Canada I realised this lifestyle could not continue. Not only because we no longer had a breakfast room, but because the instant coffee here is bad. Really bad. I don’t have a very discerning palette, for anything. I can distinguish between Coke and Pepsi, and red and white wine if I’m allowed to look, but distinguishing between Gold Blend and Full Roast? Pass. Not a chance. Over here, people can tell the difference between different brands of coffee beans just by the aroma BEFORE they’re made into a drink. People can tell the difference between a Starbucks coffee and a Tim Hortons (a couple of bucks, usually) But the instant coffee is so bad, even I couldn’t drink it. We’d brought over our caffetiere, relic of dinner parties we’d never had, and it got a bit of a thrashing in the first few weeks as we used it every morning. Eventually the inevitable happened, and we smashed the glass bit. That’s when we bought the beauteous machine in the photo. 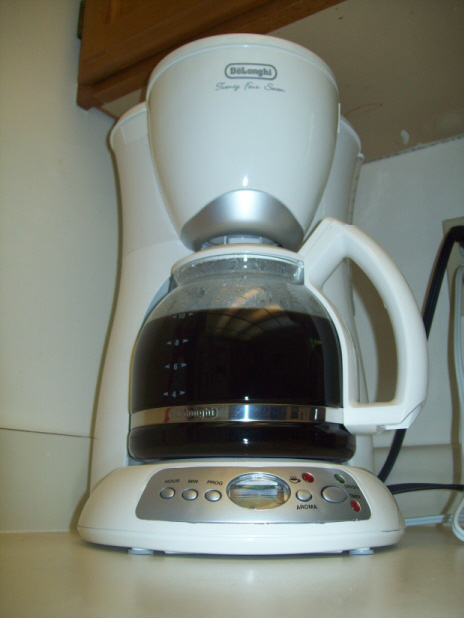 A coffee maker! Load it up and it makes coffee for you! No plunging! You can even program it so that it comes on while you’re doing the school run and you come home to fresh, piping hot coffee! Miracle! Sadly, all things must end. Yesterday I put on the coffee maker and hopped into the shower. I came out, dressed, and poured myself a cuppa. It was empty. The coffee was not made. I looked out the window, in case the Apocalypse had come to pass. But it was worse than that – the coffee machine was broken. I’ve had twenty four hours without coffee, as the new machine had to wait until the shops were open. I’ve been that long without coffee before, of course, but that was by choice. This time I didn’t have coffee because I couldn’t and that was harsh, dear reader, harsh. Anyway, normality is restored with the arrival of the shiny new machine and a steady stream of liquid revitaliser, to which I give the credit for the completion of my first full-length play. Less than a year in the making, but at eight cups a day for ten months, that’s….a lot of coffee. This entry was posted in Uncategorized, Writing and tagged Apocalypse, Beans, beer, Bournemouth, Canada, coffee, coffee maker, Coke, drunk, Hemingway, Pepsi, playwright, Starbucks, Stephen King, Tim Horton's, writing. Bookmark the permalink.